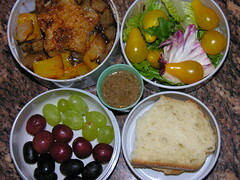 Last day of the workweek, last day of the month, Friday, August 31, 2007, and my Mr. Bento has quite a mishmash of stuff in it. The big bowl is a mix of Asian, southwestern barbecue, and German. The star is toasted brown rice, and it's ringed with chicken bratwurst, yellow bell pepper, and onions, tossed in Rudy's BBQ Sause (that's how it's spelled). Tri-color grapes are from Whole Foods; sourdough bread's from TJ's. The little dressing container is balsamic vinaigrette, going over the salad with little yellow tomatoes.